An ECDIS is a real-time Geographic Information System (GIS) that combines both chart and sensor information into a real-time navigation tool. SOLAS compliance required installation of ECDIS equipment on board ships in a phased manner with Mandatory Carriage date depending upon the type, size (Gross Tonnage) and the date of keel laying of the vessel commenced with High Speed Crafts by 1st July 2010, All Passenger ships (>500GT) by 1st July 2014, All Tankers (>3000GT) by 1st July’2015 and All Cargo Ships by 1st July 2018 (> 3000GT built after 1st July 2014 and >10000GT built before 1st July 2013. 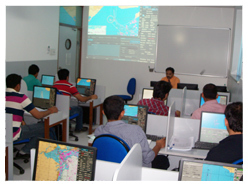 The refresher training is designed to import up to date knowledge in various developments in ECDIS, to the Deck Officers having IMO Model Course 1.27. Understanding and interpretation of IMO ECDIS Performance Standards. Understanding ENC usage bands (Overview, General, Coastal, Approach, Harbour and Berth). Safety Parameter, Look Ahead, Alarm configuration and setting for Anti-grounding. Understanding and applying the Survey Accuracy represented by CATZOC and taking it into account for determining Minimum Depth Required (MDR) in Route Planning and Route Monitoring. Identification and interpretation of Wreck, Rock, Obstruction as Isolated Danger symbols in Navigable as well as Non-navigable Waters on shallow side of Safety contour. Route Planning and Monitoring guidelines having due regard to MARPOL, Environmentally Sensitive Sea Areas, Particularly Sensitive Sea Areas, Right Whale Areas etc. Current status of inclusion of T & P Corrections in ENC, AIO Display, EP Corrections and their application.